Albion Awakening: How may we actually, in practice, assist in sustaining and developing the spirit of Albion? How may we actually, in practice, assist in sustaining and developing the spirit of Albion? In a nutshell; by being fully here and fully conscious - such that my own thinking of that time, place and nature is woven-into the evolving web of creation. To backtrack and explain... There is an attuning to time, place and the nature of things which we may turn an epiphany - a passive, absorptive, time-less 'snapshot' of a situation. You may recall such things from early childhood: a numinous picture (or perhaps sound, or smell); deep, engaged, lively... and detached. We have, in a state of raised sensitivity, taken a true-impression. Such epiphanies do not affect creation - they are not, at any level creat-ive. As I said, they are the true impact that Life has upon-us. Such are valuable; yet they do not sustain or develop Albion. They are Albion affecting-us - a memory that is valued; but tinged with regret because gone as soon as registered, and powerless to prevent it. More is possible, desirable and - indeed - ought-to be aimed-at by the lovers of Albion. My example here is of Albion-overseas - of New England, in the United States - and with reference to the mid 19th century world of the Transcendentalists of whom the first I came to know was Henry David Thoreau. 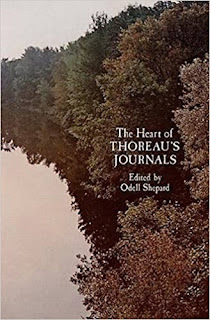 I can illustrate the epiphanies by an example from a library: looking at the cover of The Heart of Thoreau's Journals in Bristol City Library, one Friday evening late-opening... losing myself in an appreciation of Walden Pond, Concord, Massachusetts - where Thoreau spent two years, two months and two days in a hut he built for himself as an experiment in living: living for the real things. The next step - and the first step that is actually of material assistance to reality - is to appreciate as a Segment of Life. Not a passive impression; but a state active, alert, wide-eyed, curious - in which my thoughts and the unfolding-reality unite and are woven-together. The example is again related to Walden Pond; this time an early morning circuit of the pond with my wife in the Fall of 1998; a magical hour in which reality un-folded, and folded-into memory and anticipation, with an unexpected inevitability. The 'magical' state of consciousness, when sustained in this fashion, becomes a part of ongoing creation - so that creation becomes, to that extent, enhanced by our personal self-awareness. The effect is permanent, and made distinctive by the human consciousness. But more can be done than this; when our real-divine self is active, and generative, and in Primary Thinking - which is creative in a primal sense. New thoughts emerge which are uncaused and never have been before - and these thoughts are in loving harmony with the divine unfolding of creation. This is what JRR Tolkien called Subcreation, and Owen Barfield called Final Participation. So, this is the rare kind of primary creativity which is not given value by its public communication nor by public appreciation nor by any excellence it may posses... but which has intrinsic, instant and permanent value in reality: that is in God's creation. Such is woven-into and changes creation; not only by its origin in human consciousness, but by its actual addition to the scope and realm of attained creation. After it, everything is somewhat changed and forever. My personal example is the process of selection, sequence and transition that went into the making of my radio documentary Solitude, Exile and Ecstasy, which included Thoreau's words and references to Walden Pond. For several hours together, I was in an elated and hyper-aware state - and felt not just an external sense of what was right and effective, but that this also came from within my real self. I have little doubt that those solitary and ecstatic hours of mine left their permanent traces in the web of creation, as it relates to that expression of Albion's spirit that is New England; and that was shaped at Walden and its environment, by Thoreau and others; and which continues and always will as an aspect of God's creating.